Replace the factory’s weak and flexible rubber bushed panhard bar on your 1959-1964 Chevrolet B-Body Impala, Biscayne, Bel Air, etc. with our heavy duty adjustable unit! After more than 50 years of use the factory panhard bar is corroded and the rubber bushings are cracked and dry rotted which adversely effects the performance of your car. Fitment Note: May not fit on station wagons. If installing on a station wagon verify the length before ordering. The center to center dimension of this panhard bar is 31.375″. Fits Chevrolet B-Body cars only. Replace the factory’s weak and flexible rubber bushed panhard bar on your 1959-1964 Chevrolet B-Body Impala, Biscayne, Bel Air, etc. with our heavy duty tubular unit! Our new rear suspension package for the 2005-2012 Challenger, Charger, Magnum and 300C includes a pair of rear trailing arms (track bars), rear upper lateral control arms (rear position) and rear upper lateral control arms (front position). This package is a $15.00 savings over ordering each item independently! Our adjustable chrome moly tubular rear upper lateral control arms (front position) for the Chrysler 300C and Dodge Charger, Challenger and Magnum will allow adjustment of and lock in your camber settings, minimize wheel hop and increase traction! 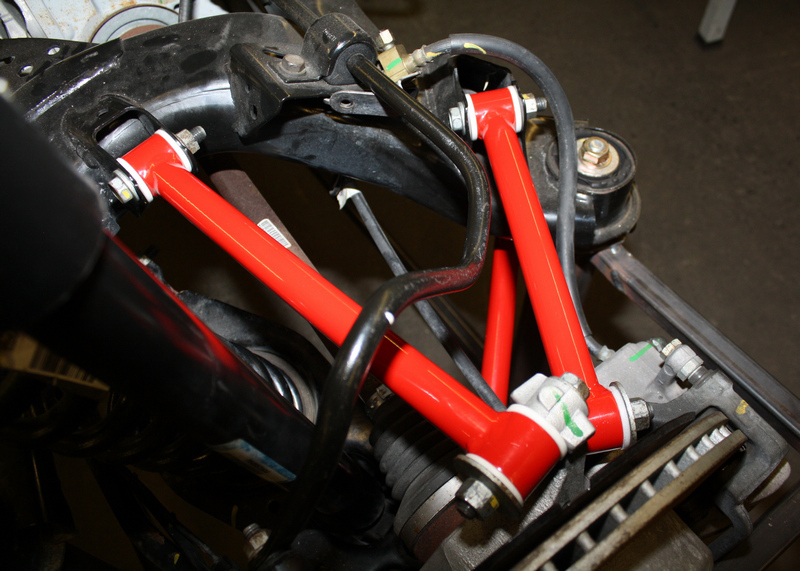 Our adjustable chrome moly tubular rear upper lateral control arms (front position) are much stronger and lighter than the factory’s cast arms. They’re constructed from TIG welded 1.00″ x .095″ wall 4130N chrome moly tubing providing for maximum strength and durability. They’re equipped with greaseable Delrin bushings for zero deflection rather than the soft rubber bushings that come from the factory. They are a 100% bolt-in installation using factory hardware. They’re available powder coated in your choice of bright red or gloss black a brilliant and durable finish. Our chrome moly tubular rear upper lateral control arms (front position) for the Chrysler 300C and Dodge Charger, Challenger and Magnum will lock in your camber settings, minimize wheel hop and increase traction! Our chrome moly tubular rear upper lateral control arms (front position) are much stronger and lighter than the factory’s cast arms. They’re constructed from TIG welded 1.00″ x .095″ wall 4130N chrome moly tubing providing for maximum strength and durability. They are a 100% bolt-in installation using factory hardware. They’re available powder coated in your choice of bright red or gloss black for a brilliant and durable finish.